Last year, every evening when the sun went down, foxes would visit our front yard. At first, they came to eat what was left of the birdseed we put out on big flat rocks each morning. I know some people think foxes are particularly nasty animals and should be hunted down and killed. Kathleen and I think they're beautiful, and we enjoyed their nightly visits so much that we started leaving the outdoor lights on so we could see them better. And we spread dog food on the flat rocks to entice them. On occasion, we'd sit on the front porch and watch them feed only 15 feet away. Sometimes four of them would come at the same time. They were so regular that we'd tell visitors, "Hey, you wanna see the foxes?" "The most ordinary thing becomes precious once it's taken away." Now they're back! And we appreciate them even more. A few days ago I saw a blue jay in the front yard. Big deal, right? Well, it was. 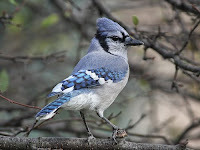 It was the first time we had spotted a blue jay in our yard since we arrived here in the Texas Hill Country. We had seen them in nearby towns, but not in our yard. Where we used to live, in Vero Beach, Florida, more than one family of blue jays inhabited our yard. We saw them and heard their familiar screech every day, and we took them for granted. What's common in our Hill Country yard are scrub jays. They're gorgeous birds, slightly smaller than blue jays and powder blue instead of a mix of dark blues. Scrub jays were a rare treat in Florida. We saw them mostly on golf courses, but never in our yard. Here the jay situation is reversed. Scrub jays visit every day for the peanuts that we put on the rocks. But no blue jays. So something that's right in front of you all the time can stop seeming precious. If you aren't mindful. Mindfulness is the practice of focusing your awareness on what's around you without analyzing it. This isn't the way we normally perceive. Normally we sense something, then react with feelings, thoughts, memories and other associations. We rarely just perceive something in a pure way. I often tell the people close to me, "Now that most of my life is over, I have no more time to waste." A good way to keep from wasting time is to relish the moments you have left. Be aware of things without judging them as ordinary or plain or adverse. Let people and things amaze you. Appreciate what you have while you still have it. All of us are challenged in one way or another, but I encourage you to appreciate that today, right now - these are the good old days. Post by Dennis E. Coates, Ph.D., Building Personal Strength. Nice reminder, Denny, that we can overlook the things in front of us every day. I appreciate your perspective that there's no time to waste yet there's always time to pay attention and appreciate what is before us.